New to Lanta I chose Mooks as a base to have a look around once we had arrived. But was more than happy with the resort and decided to stay all week. The owners Nick & Melissa make you feel right at home, and have plenty of good advice about the island. Also best Full English I've had in ages! Staying here, you get a real "island feeling"
the ladyboy at the front desk is very friendly, and was very helpful. i originally booked a non-ac room, for two nights, but due to a change in plans, i could only stay at mook lanta for one night. i was upgraded to a ac room, which was huge. two bedrooms, two baths ... perfect size for a family. the showers and toilet are outside, but completely covered, and because of the heat, it feels real nice to shower outside. hot water is available. the breakfast was real nice. beds were clean. toilets and showers were clean and decent for being outside. i would suggest buying mosquito punks (the green circle things you light) and leaving them outside your doors. quite a bunch of mosquitos. the set up of the hotel is very fun. you walked on a raised walkway that connects to all the bungalows. free wifi in the lobby. five minute walk to the actual sand beach. but, you have to walk a ways to long beach because the area that is closest to the hotel is all rocks. there are restaurants that line the main road near the hotel. tv in room. ***i think if i stayed in the fan room, my review might not have been so friendly. My boyfriend and me stayed here for a week, we loved Mook Lanta! Friendly staff, cleaning every day, scooter rental, beautiful and big bungalows in a green and peaceful environment, great location (close to the beach, supermarket, village). We definitely recommend Mook Lanta! Me and my friends are backpacking around Thailand and came across this beautiful resort. The room for the price we paid was absolutely outstanding, with fab air con! (after staying in hostels) the rooms were spotless every day and the relaxed atmoshphere was perfect for a couple of nights stay. The owners Nick and Mellissa were absolutely lovely and so helpful giving us advice on places to go on the island. They even offered to take us to Krabi in their mini van if we wanted to for our next stop. Thank you so much for making us feel so welcome and taking the time to help us settle in nicely. If there was any comment to make at all, it would be potentially getting a mattress topper for the double bed in the family bungalow as the mattress was pretty hard, but other than that it was absolutely perfect! Thank you so much Mook Lanta for a lovely experience. My 6 year old and I stayed here for 3 nights and wish we could have stayed much longer! The owners were so helpful and friendly. The room was absolutely magic! Location was fantastic, close to restaurants and shops. The rooms were nice, good breakfast and surroundings. The beach is relaxing too and not far away. A little hard to get information/ recommendations from one of the hotel managers but the owners were generous in their opinions. We joined a few tours with them and also ordered a transfer and they were very helpful and reasonable in rate. Thanks for a great stay! When we arrived at Moon Lanta we were greeted promptly by one of the owners, who was very friendly and welcoming. Check in was efficient and we were in our amazing bungalow quickly. The room was perfect for what we needed! The resort was close to the beach and the owner kindly got us a bike rental so we could explore the island for a cheap price. In the morning we experiences by far our best breakfast since being in Thailand!! We stayed two nights, and would have loved to stay more. The owners made us feel very welcome and could help with anything we needed from info on ferries to taking us to the port in the morning. Would 100% recommend this resort! Thanks you! The owners are lovely and welcoming, giving ideas of places to go and things to do. Always making sure you are happy and if there is anything needed. The rooms are exactly what you expect from the pics, you won't be disappointed by amazing photos that don't look like the real rooms. Amazing location, easy to get around and they rent good scooters at good rates. Nothing bad to say! Catch an amazing offer in the low season!!! We absolutely loved the location, close to the main road but far away to feel secluded from the hustle and bustle. Easy access to beach. Nice and cosy resort! 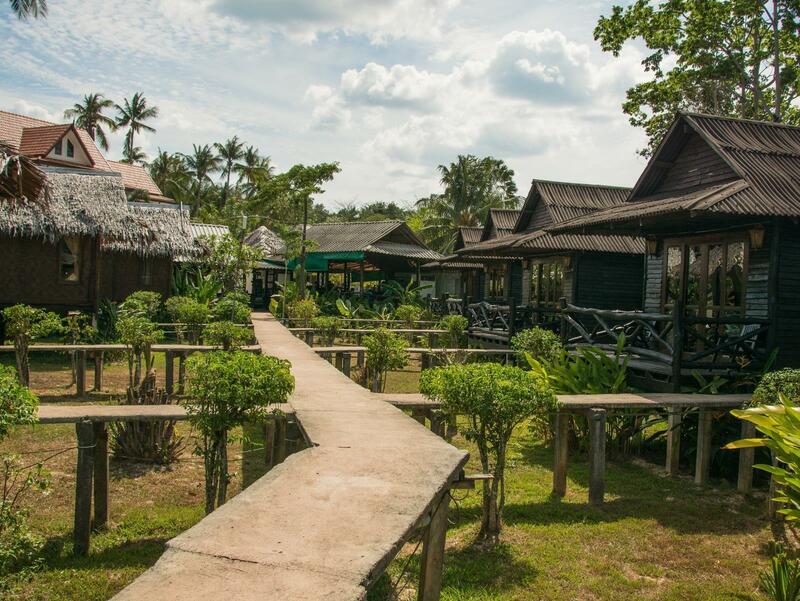 We really loved out stay at Mook Lanta. The family bungalows are great and were exactly what we were after! Easy to get to the beach, great restuarants and bars all within walking distance. Only problem is that we had to leave after 2 nights, wish we could have stayed longer! Our stay was brilliant, although we booked the basic (cheaper) fan room it was still fine for what we needed. This was made all the better by the owners going out of there way to help us at any point possible. Made us feel so welcome even though we arrived late and were a bit confused of what to do that night, they pointed us in the direction of some great thai food and then a brilliant bar for trivia and a bit of a party afterwards. Recommend this place for the survive alone, the location is also brilliant just off the main street, nice and quiet. Wonderful stay here. Short 3 min walk away the beach and to the street with plenty of restaurants nearby. The staff (especially Melissa) went above and beyond to organize trips, rent bikes and take care of our ant problem in the cabana. I would recommend staying here. The service provided by the staff is superb. The place is 7 minute walk to the beach. Great value! one of the owners) save one of my days there. I was book to go diving with a dive operator but we found out the same day of the diving trip that the trip was canceled. She called around 5 other dive centers and found one that will take me diving that day. Not only that but she drove me to the dive center!! (10 min dive). Great service, very friendly people. I couldn't believe in an overtouristy island like Koh Lanta the personal friendly service the owners Mook Lanta gave. Yes!The Awesome Ozzie owners actually greeted me,checked me in and got me situated. Tired and dirty from hours on the motorbike, I had a big clean bed, hot shower and cable tv, oh and wifi! in a serene cabana compound. Just a short walk to the turquoise water and powder white beach, I really enjoyed my stay there. Would definitely go back. I stayed at Mook Lanta for 13 days as I had been travelling for over two months and wanted somewhere to spend the last bit of my time relaxing near beautiful beaches. From the time I arrived, I was very well looked after by both the owners and the staff who were full of information on things to do and see on the island. The owners Mellisa and Nick went a above and beyond the norm in making their guests time with them special. On a number of occasions they offered lifts to various places on the island and also arranged a night out for everyone staying with them to the other side of the island to take part in the Loi Krathong Festival at the beginning of November. I felt that they provided a good balance of hospitality and privacy. The staff at Mook Lanta were always pleasant and smiling. Thanks to all at Mook Lanta for a wonderful time on Koh Lanta. I hope to be back sooner rather than later with family or friends. The resort is a little 'back to basics' and you are surrounded by nature so be ready for lizards and mosquitos (although there is a net over your bed). It's a very friendly place, staff and other guests always smile. The hotel is very close to the beach which was nice and quiet. The best thing about this hotel is the owners as they were both really welcoming and helpful, especially when I was ill from sun stroke and they gave me rehydration drinks and dropped us to the ferry the following day. I'd recommend this hotel for a back to nature experience and friendly atmosphere! we arrived in koh lanta a couple of days before new years and booked to stay 1 night at mook lanta on the day we arrived. we had booked the last room they had (bungalow with a fan) which tom showed us (which looked pretty bleak) however tom also offered to show us rooms at their adjoining property (tropicana) which had recently opened for the same price. the bungalows were tidy & airconditioned with a nice little porch. we got a great rate through tom (including scooter hire) & in fact ended up staying 12 nights in total. great value for money however toms business partner may come across a little pushy with tours etc - shop around before booking tours! Have stayed here a couple of times. You can find cheaper probably, but it's not bad value. Good rooms. Walking distance to the beach, but you will need a Motorbike to get around, which is one of the highlights for me, driving around the Island which has 3 or 4 excellent beach. The People of Lanta are lovely and are more than help to help in any way they can. Very cute, small unique resort, nice but basic rooms, basic setup but extremely helpful staff! this was a very cute, comfortable 'resort'. it's small (i think 20 rooms) with basic, clean rooms, but everything you need. it's a 1 min walk to a great beach, super helpful staff and very unique. would definitely go back. excellent value for money. i didn't see a spa though? but there are lots around, and a great one right on the beach close to mook lanta. We booked this place at Koh Lanta and it was a big mistake. The standard of the Fan room is very very low and it`s really overpriced. Just forget about it and go few meters down the road and you will find much better and (2-3 times) cheaper accommodation there.